Booth sees that Brennan has been organizing several job offers. She has compiled his job offers too. They talk about whether or not they should make a change. Then, they go to a crime scene to see a dead body that has been posed. They wonder if it has anything to do with Pelant. 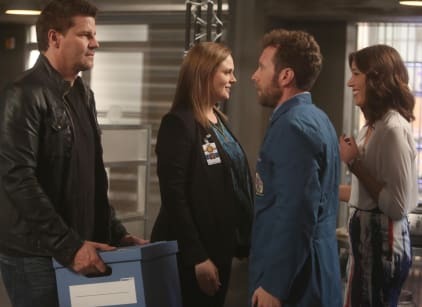 They find a flower in the body’s mouth, which Hodgins says means, “be warned.” The team works to investigate, and Angela shows up to help for one last case before she and Hodgins leave. Wendell also joins to help. Booth tells Brennan that she’s right. He says this will be his last case, and they talk about what their new lives will be like. Aubrey questions a suspect, and Wendell and Edison continue to help Brennan examine the remains. It seems that the killer is a copycat who is unsure of what they are doing and questioning their actions. Caroline questions why Booth is stepping back on the Pelant case. He tells her this is going to be his last case, and Caroline gets emotional. Daisy shows up to say goodbye, then jumps in to help on the case. Brennan tells Angela the news, and Cam overhears too. Cam is overwhelmed that everyone is planning to leave. Edison, Wendell, and Daisy all work together on the case. They determine that the killer had a limited range of motion, and Brennan is impressed. She seems to feel good about leaving the lab in their hands. Hodgins finds clues in a pizza box. Then Brennan and the interns see that a suspect’s girlfriend might be a suspect. Aubrey and Booth chase after the suspect on a moving train with chickens. She tasers Aubrey, then nearly pushes him off of the train. Booth arrives just in time to shoot the weapon out of her hand. Angela tells Hodgins that she found the money that Pelant had taken from him. Then he tells her to get rid of it. He says it isn’t his money anymore, and they don’t need it. Angela agrees, but tells him they should stay. Arastoo arrives to see Cam crying over the fact that Booth and Brennan are leaving. Booth says an emotional goodbye to Caroline and Aubrey. Angela shows Brennan and video from Pelant, but she turns it off and says she doesn’t want to see.